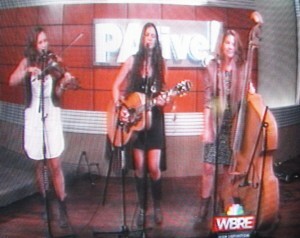 WBRE’s PA Live featured a live performance by female trio Sassafras was broadcast on August 18. Cohost Jasmine Brook interviewed the folk/bluegrass ensemble, who were also included in a taste-testing at the end of the program. 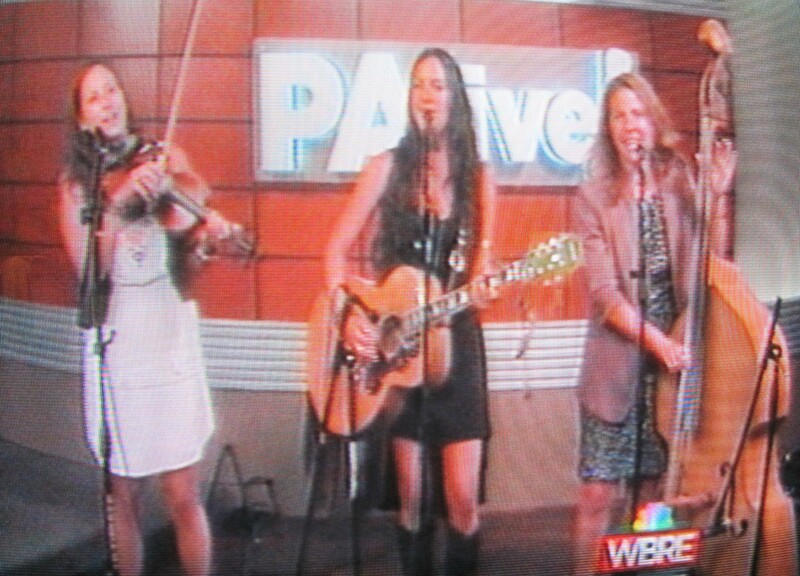 With a spirited performance of “Goldmine,” the three members of Sassafras, Jillian Hannigan, Christina Cox, and Jessica Illuzzi made their local television debut Monday afternoon on PA Live, a news magazine/lifestyles show broadcast weekday afternoons on WBRE TV 28 of Wilkes-Barre. Complimented at the onset by PA Live cohost Jasmine Brook on their fashion sense, the three-piece all-girl ensemble wowed the program’s personalities and crew with their seemingly effortless renditions of the folk/bluegrass songs they offered. Illuzzi related that Sasssafras does not have a particularly long history together, but the three women consider themselves to be best friends. As the program segued to the cooking portion, Cohost Dave Kuharchik was still gushing at the talent he’d just witnessed, commenting that expects Sassafras’s star to continue to climb. Chef Yvonne was also clearly impressed by the performance. Sassafras, the members of which hail primarily from the Endless Mountains, has a knack for making traditional country and bluegrass music sound as fresh as if it had been invented yesterday. The intensity with which they approach such standards has endeared them to fans of traditional bluegrass, country music and folk rock. WBRE was in fact so impressed by the performance that Sassafras has been invited back to perform in prime time during at 8 pm broadcast on Thursday, Aug. 21. 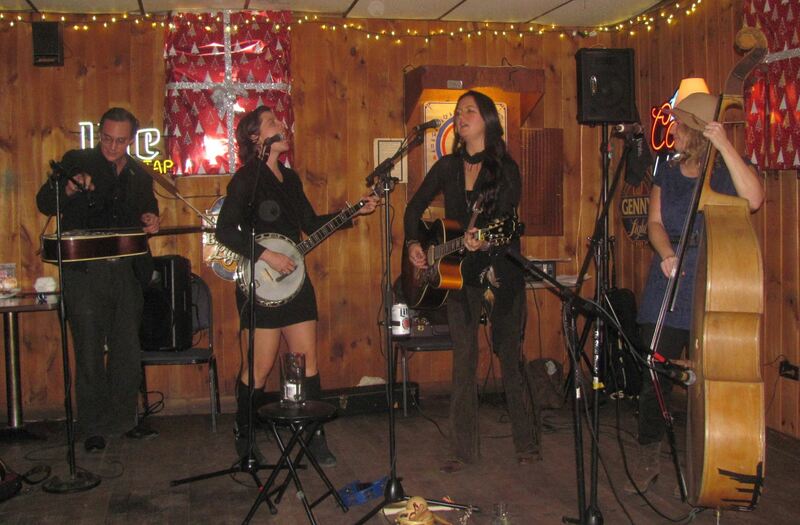 Sassafras Duo, featuring Illuzzi and Cox, will play at Shadowbrook Inn & Resort on Route 6 east of Tunkhannock this Friday, Aug. 22, from 7 to 11. The 60-minute program television concluded (below) with the members of the band taste-testing the shrimp and scallop dish prepared live by Chef Yvonne. 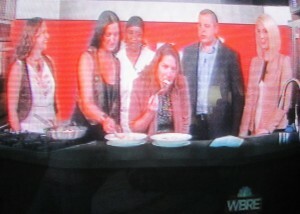 The girls agreed that the dish prepared by the owner of Vonz Restaurant in Tamaqua was delicious.